This is a course about using spreadsheets to model businesses and business processes, from the perspective of a manager. It emphasizes both the modeling techniques, and the process of modeling itself. That is, we're not only interested in building models that managers need, but we want to build them in ways that are easily managed, and that give reliable and cost-effective results. In the form of a stand-alone Web site, it has dozens of examples. This is a stand-alone Web site available to download. Includes three months unlimited email support. This course was delivered to students in classes at Harvard Extension School, for 21 years, from 1993 to 2014. 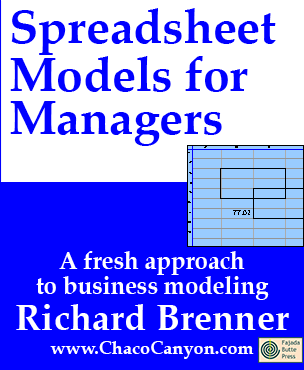 Although it is no longer offered there, I continue to update it with new techniques and new ways to approach business modeling using spreadsheets. Development is continuous. This downloadable edition has benefits compared to the online edition, because you can use it anywhere you take your computer, and connection to the Internet is not required. This item is available only in downloadable format.